The Heaven constellation is a group of seven systems on the fringes of known space. In the middle of the constellation lies the Utopia system, where the headquarters of the Angel pirate clan are located. The Angels are today one of the oldest and most powerful of the criminal organization found in the world of EVE. They established themselves in Utopia system a century ago and soon had the whole Heaven constellation under their control. At first they mainly acted as ‘muscle-for-hire’ for other criminal factions, but soon they started expanding their activities. They slowly but steadily increased their influence in the underworld and today DED consider them the most dangerous criminal faction around. The Angels’ area of operation is much larger than that of most other crime syndicates. Due to this, the Cartel is divided into many smaller operational groups, each of which is prefixed with a specific name hinting at their role (Guardian Angels, Dark Angels). But many believe that there is another reason behind the power of the Angels. The Heaven constellation is the former habitat of the Jovians. The ancestors of the Jovians settled in Utopia while the EVE gate was still open. The Heaven constellation was the home of the First and Second Jovian Empires, both larger and grander than their current Third Empire. The Third Empire was founded half a millennium ago amidst the devastation of the Jovian Disease, which threatened to disintegrate Jovian society. In a desperate attempt to escape the wrath of the mysterious epidemic, the Jovians decided to relocate to another part of the world. Three huge vessels were built, termed Motherships; they were the first Titan-class ships ever built. 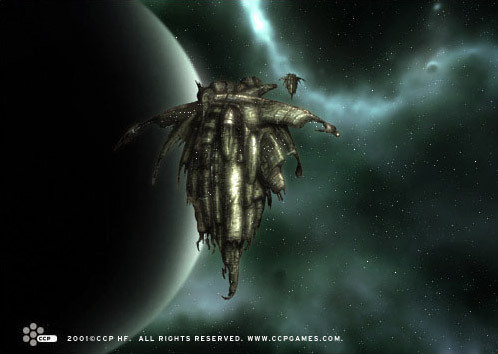 The majority of the Jovian population relocated in the Motherships. Those showing any sign of the Disease were left behind to die. Some couple of centuries later, when space traveling had become a common thing, the constellation was entered by migrating scavenger groups. Many of those groups set themselves up within the constellation and eventually they evolved into criminal organizations. The strongest of those was the Angel cartel. They took over the abandoned but still intact Jovian space stations scattered around the constellation and rumors abound that some hidden secrets the Angels unlocked in these old stations is the real reason for the Angels’ rise to power.